Ever wondered how financial experts run their own personal finances? As many of you know, I work in finance in my day job. I never talk about financial products or specific recommendations in social media. But over the years in my career, I have picked up some excellent general tips and whipped my own finances into great shape. A lot of people ask me for tips all the time so I thought I’d share with you how I run my own personal finances so that I’m always making progress toward my goals. I keep an emergency fund at all times. It’s not JUST for emergencies, I’ll also use it for opportunities or larger purchases that are planned, such as a vacation or a down payment on a car. I keep this savings fund separate from my chequing account. I pay myself first. I have a budget that I stick to each month*. When I initially created my budget, I included my savings contributions as fixed expenses. My savings amounts are non-negotiable – NOT what’s left over after I’ve created the rest of my budget. The rest of my budget has to fit around my savings commitment to myself. I use my no-annual-fee credit card for nearly all purchases throughout the month. I pay it off in full every payday (which, for me, is every 2 weeks) so I never pay any interest on purchases. And I rack up points on my card for all the purchases that I have to make! I’ve redeemed points for a free plane ticket to see my guy in Ontario, and I still have more points left for another trip! I set up all fixed expenses (where possible) on pre-authorized payment plans. That way they’ll never go unpaid due to forgetfulness. I keep a finance calendar. Listen up, because this is my BEST SECRET. I use Outlook, but any calendaring system like Google Calendar would work just as well. I put in everything that happens in a recurring manner as a colour-coded recurring appointment in my calendar. Payday is a green recurring task. And every single item that will be drawn directly out of my bank account on a particular day gets a red recurring task with the amount indicated. This means I can always see at a glance what a month of income and expenses looks like. I always keep a buffer amount in my bank account. Never let your planned expenses and withdrawals take your main bank account balance below this buffer amount. This leaves room in your account for unplanned or forgotten withdrawals without running the risk of a payment bouncing. I log into my online banking and pull up my current bank and credit card balances. I pull up my finance calendar. On a scrap of paper, I write down my current exact bank balance (once the paycheque has been deposited). From there, I subtract all expenses and savings contributions that will be withdrawn from my bank account before my next payday. I also subtract my bank account buffer amount, and I’m left with the minimum amount that MUST be left in my bank account. From that amount, I subtract the total amount I need to pay off my current Visa balance (and I damn well better have enough to pay it. If I don’t, then I’ve been spending irresponsibly and it’s time to tighten the budget immediately). I transfer the balance to pay off the Visa by doing an online payment. What’s left, after accounting for my buffer and expenses, is the amount I have to play with. Depending on my priorities at the time, I may use this amount to pay down my line of credit (if needed), or as a lump sum boost to my retirement savings or emergency fund, or sometimes I might spend it on something special! Using this method, I have not missed a deadline or had a single bill payment bounce in over 9 years, I have really great credit, and my net worth is edging upwards with every pay period. And I do it all over again each pay day. It takes a little bit of work initially to set up your budget, finance calendar and pre-authorized savings and bill payments (but isn’t your future self worth it?! ), but once they’re done, they go on autopilot. The calculations for bill payments takes me about 5-10 minutes each payday. I now love the little fist-pump feeling I get each time I find out how much I can use to pay down debt faster or boost my savings, so I love doing this exercise! Any questions that I might have missed that you’re curious about? This entry was posted in Finance, Systems and tagged budgeting, net worth, personal finance, saving on March 24, 2014 by A Little Coffee. In light of the fact that I’ll be merging two households into one in the near future, and also that I’m moving to a new place in a couple of months, I’ve been thinking a lot about home design and making a fresh start in this area. I’m not moving for a few months, and until I’ve got myself into the new space and got a sense of what will fit where, I don’t think I should be buying any furniture. And yet, trolling Craigslist for cool finds has become an OBSESSION. I am totally into the more unique stuff you can find this way, and also the incredible cost savings! Plus I feel good buying pieces that are already out in the world, rather than something brand new. It feels less “consumer-y” that way. Since I’m just window shopping and can’t pull the trigger on any purchases, let me share my great finds that I wish I could buy with you all! Someone in Vancouver, please buy these so I may live vicariously through you. Sofa and love seat set, $150 for both. Ridiculous deal. 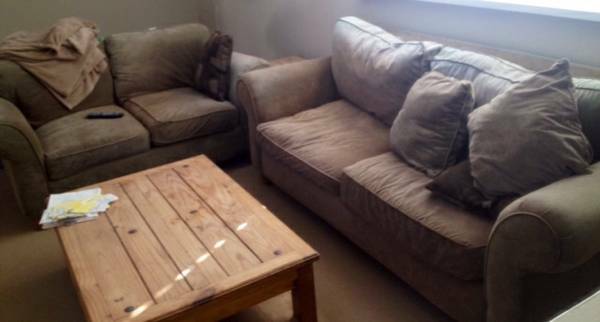 Not that there’s anything inherently special about this couch and matching loveseat, but $150 for the pair? They must be desperate to get rid of these items, that’s a steal. 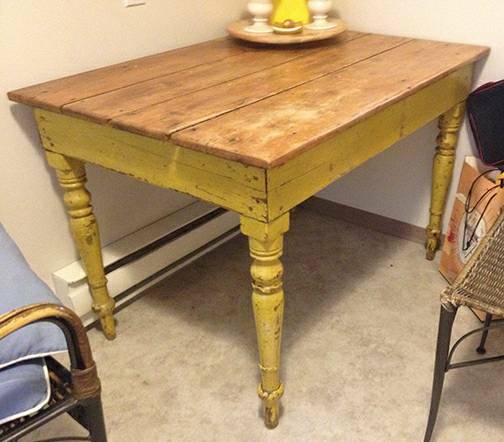 Antique, shabby chic kitchen table, $150. Due to my lack of design vision, I would have a hard time figuring out what type of chairs to pair with a table like this. But I LOVE the table! 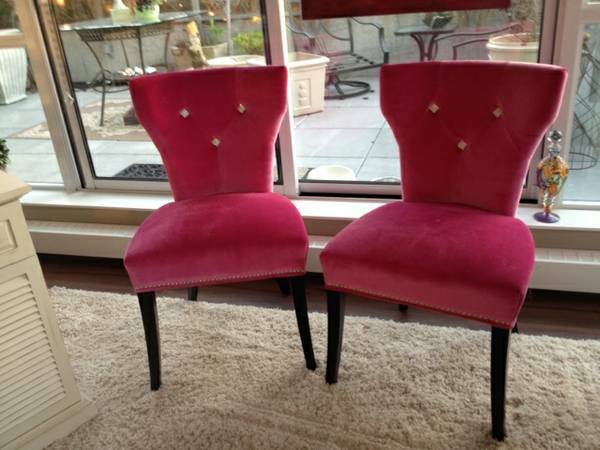 Two pink velvet occasional chairs with jewels, $125 each or $220 for both. I think these bright pink chairs would add such an element of fun to an otherwise plain living room set. But I suspect my lovely boyfriend would kill me if I chose to add two pink velvet sparkly chairs to my living room JUST when he moves in with me. If only I’d found these years ago! 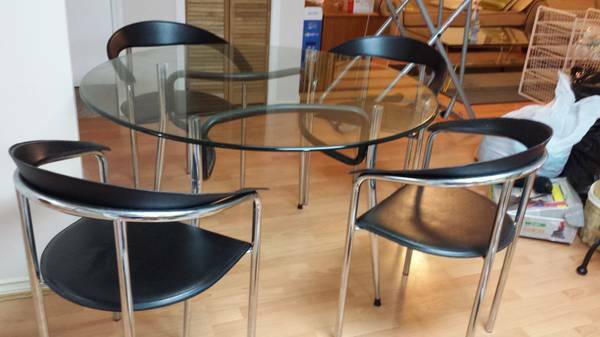 This table & chairs set for $100. The table is fine, but the chairs are what make this really cool! And I can’t believe they’re selling the lot for $100. I’d probably buy this despite my no-buy policy if I had a van to transport the set in short order! 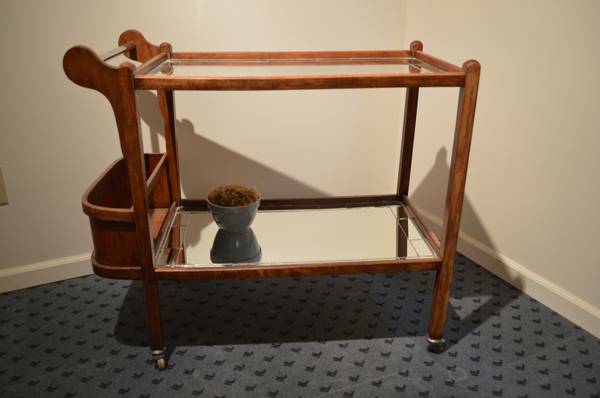 Wood & mirror bar cart, $150. Would you LOOK at this vintage beauty! It is one of the silliest (and probably easiest to achieve) dreams of my life to own a vintage-style bar cart and have it fully stocked, at the ready to make a cocktail party live up to its name. My Pinterest design inspiration board holds proof of this dream. Somebody buy these and invite me over so I can enjoy them. This entry was posted in Creativity, Design, Home and tagged craigslist, furniture, home decor, thrift shopping, vintage, window shopping on March 1, 2014 by A Little Coffee. The moment has arrived for me to write about some unbloggable things… things that overtook my brain and made it impossible for me to write anything else, but I couldn’t write what I wanted either, so I just quit writing. It’s taken until now for me to feel comfortable putting it out on the public web! Jurjen and I like to call each other “retro boyfriend” and “retro girlfriend” because we recycled each other from 2000. I mentioned in my last life update post that I had a boyfriend, and that we’d known each other for 14 years. He and I have been back together for about 7 months now and I’m more sure of him than I’ve ever been about anything in my life. What I didn’t mention previously is that he lives in Ontario… over 4000 km away from me. I attended college in his hometown, and we dated while I was there. I moved back to Vancouver when I graduated, leaving him behind (I try really hard not to play the ‘if only’ game over this one!) We’ve been in a long-distance relationship for the last few months. It’s been great, and we’ve seen each other far more than I would have dared hope, but it isn’t sustainable with so much physical space between us. In January, my landlord really put this to the test when he put my house up for sale – and it sold in a week! So we had to figure some housing things out, long before we wanted to be dealing with it seriously. Would I sign a lease with the new landlords? Would I get kicked out? Would I get a new apartment here in Vancouver where Jurjen could join me? Would I pick up and move to Ontario? We had so many good options, it was overwhelming to choose among them. The only thing I knew for sure is that my home would be with him. Well, I’m happy to announce that I’M STAYING IN VANCOUVER! I’m still ironing out the housing details, but it will be here. I’m so happy to have my love join me in my hometown, to discover it again through his eyes and share my favourite spots with him, to be introducing him to all my favourite people, and to build a home together. 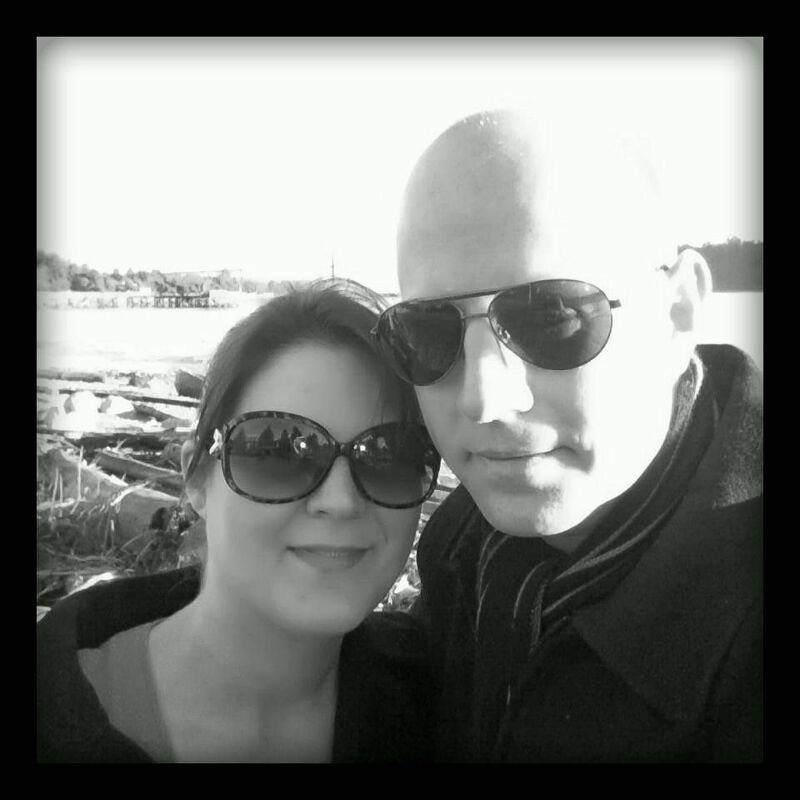 He is still in Ontario, but we’ll be together in a few short months. This entry was posted in Life, Relationships and tagged house sale, long distance relationship, moving on February 26, 2014 by A Little Coffee. 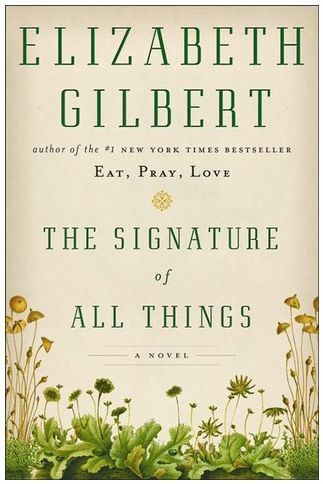 I just finished reading The Signature of All Things by Elizabeth Gilbert, and oh my, how much I loved this book! I will preface my blatant love for it by mentioning that Elizabeth Gilbert is probably my favourite author, which is possibly not a popular viewpoint. Eat, Pray, Love is a book that came along at just the right time for me, and changed my life for the better in the wake of the broken engagement that I was going through at the time. Though Committed was not her best work, I gobbled that one up as well, eager to hear more of Elizabeth’s story. Having always been smitten with the author’s gift for beautiful prose and describing the indescribable, I was interested to see how she would do with a historical novel instead of the memoirs I was accustomed to. This book didn’t disappoint. The Signature of All Things is set in Pennsylvania in the 1800’s. It follows the story of Alma Whittaker, a large and unfortunate-looking woman with a brilliant scientific mind, born to a no-nonsense Dutch mother (Beatrix) and the richest man in Philadelphia, Henry Whittaker, who made his own fortune by funneling his expertise as a botanist into profits in pharmaceuticals. Alma suffers many disappointments in life, and with nowhere else to channel her energies, she successfully becomes a well-respected expert botanist as an adult herself, in a time when most women did not work outside the home. This book has a colourful cast of complex characters who I came to adore even as they sometimes infuriated me. The relationship between the selfish, egotistical Henry and his daughter Alma was interesting to watch unfold. I loved the dynamic between Alma, her adopted sister Prudence (who was so uptight but whose inner self was slowly revealed over time), and Retta Snow, the fanciful girl who thaws the frosty relationship between the sisters when the trio are together as friends. I wished I could have grown up with my own Hanneke de Groot as my personal nanny. I adored the stark contrast of Alma’s methodical search for facts, truth and answers about the world, set against her love for Ambrose Pike, an ethereal artist concerned with God and angels. There is love, sensuality, disappointments, tragedies, travel tales, philosophical points, and much focus on the cutting-edge science of the day. One of my favourite parts of the book was how the author was able to weave real historical figures into the fictional story of the Whittakers. Before Alma was born, Henry had travelled on a botanical expedition on board Captain Cook’s third voyage. Charles Darwin was also a figure featured later in the book, to great effect! It was also interesting to read about the ideas of science that would have been considered bold and controversial at the time, knowing all we take for granted about evolution today. And Gilbert has a gift for using the flowery, descriptive language reminiscent of the 1800’s when the book is set, while still being readable in contemporary times. Alma’s grapples with what’s important, what she wants to make of her life, and her “AHA moments” reminded me of my own and got me thinking about decisions I’ve made as well. It’s a rare novel that can do that. My only criticism of the book is the portion in Tahiti was a bit of a slog to get through; it was less interesting to me than the rest. It could have been shorter. Nonetheless, I highly recommend this book and hope you’ll let me know what you think of it. This entry was posted in Books and tagged book review, botany, elizabeth gilbert, fiction, novel, science, signature of all things, travel on January 22, 2014 by A Little Coffee. 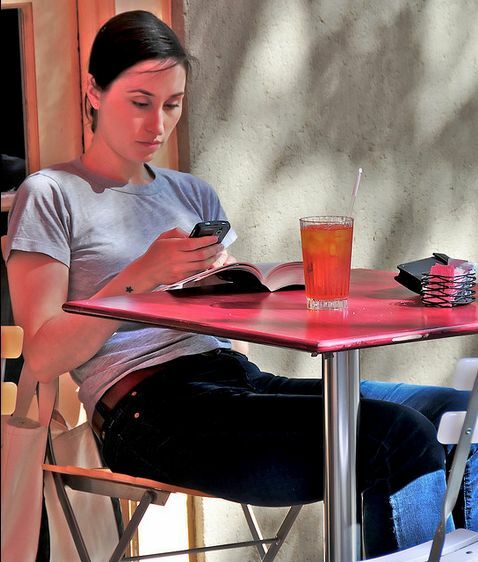 The instruction manual of our times on how to relax correctly goes like this: Unplug. Step away from the computer, put away your mobile phone, don’t give in to FOMO, be fully present. I’m totally guilty of spending mindless minutes (or sometimes hours!) reading blogs, browsing Pinterest, or texting when I’m bored or want to relax in the evening after work. It makes me wonder: Am I relaxing “right”? A really lazy day for me probably looks a lot like this: sleep in late, eat a half-assed “meal” that requires little to no prep (think: pita and veggies dipped in hummus, bowls of cereal, etc), TV watching, checking social media sites, book reading. The key word here is LAZY. This is not necessarily the usual way I would spend a day off work. I love to go outside, to hike or snowshoe, breathe fresh air, pet a dog, have brunch with friends, cook an involved meal from scratch with fresh ingredients, attend a play or take in some sort of cultural event, connect with others, go for a drive and take in beautiful scenery. But I’m unlikely to do many of these things when I’m very worn down. Here’s my thought: I think we should be making a distinction between the best activities for free time when you need to recharge, and free time when you have plenty of energy. The instruction manual hits the nail on the head for those times when we are bored. In my experience, in this state your brain is hungry for something novel to focus on. It is fully charged and looking for a challenge. This is not time best spent playing solitaire on your phone. This is time you should reach out to other humans, take a class, focus on learning a new skill, engage in stimulating conversation. Putting your phone down helps to properly take in these experiences! But when I’m zapped, tired and overworked, it’s sometimes all the energy I can muster to sit on the couch with my laptop and read up on current events or listen to a favourite podcast while playing a computer game. The alternative, honestly, would be to lie down and take a nap, disengaging from the world of consciousness entirely. I don’t think I should be apologizing for this. As a textbook introvert, I am pretty boring company if I go to social events while depleted; I turn into a rapidly wilting wallflower. I need some alone time to get that energy back. One of the best ways for me to do this has generally been to hide out with my computer and allow my thoughts to wander while playing a minimally taxing game, or reading light fluffy articles that make me laugh. The struggle is to keep this balanced and not sway too heavily toward time spent idly with electronics. But electronics also give me the gift of recharging. I don’t like my gifts with a side of guilt. This entry was posted in Technology and tagged fomo, relaxing, time management on January 19, 2014 by A Little Coffee. So I’ve been on a little hiatus. Truth be told, my life has been a (mostly awesome!) mess of Unbloggable Things for the last couple of months, and it’s all I can think about it, so it’s all I felt capable of writing about, except… see: Unbloggable Things. So I couldn’t write about the only things I could write about. So things went dead over here. But allow me to try to separate the wheat from the chaff and blog the bloggable parts of the Unbloggable Things. His name is Jurjen (that’s pronounced like “Yurien”) and he’s Dutch, but he grew up mostly in Canada. 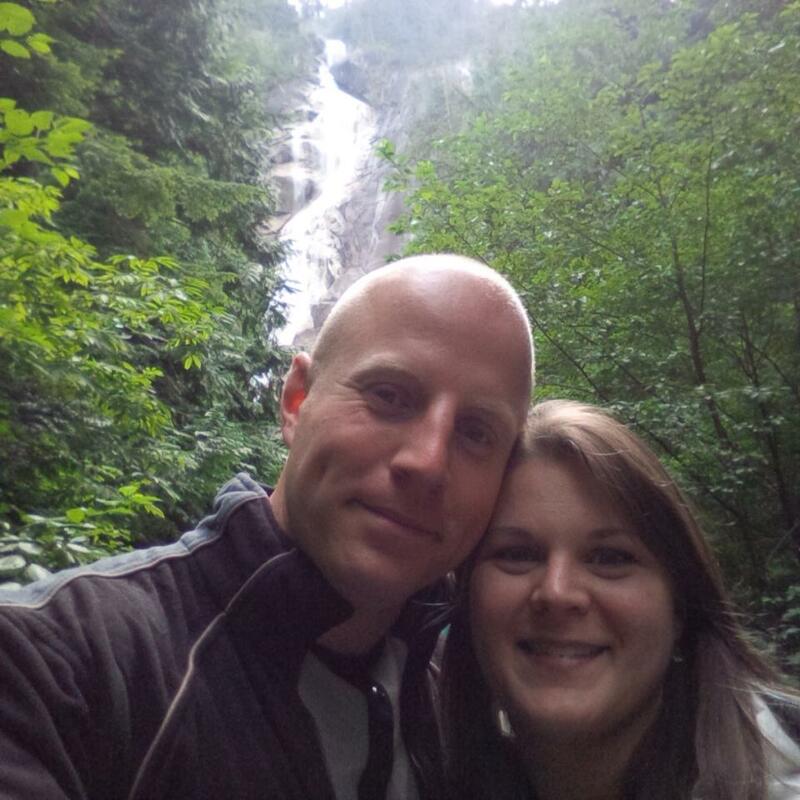 This is us about a month ago at Shannon Falls on the way up to Whistler for a quick lil’ day trip. He’s also my old boyfriend! I’ve known him for 14 years and he’s pretty much the best guy I’ve ever met. This, as you might imagine, is quite a long story that I will tell one day. For now, I will leave it at this: I’m just so content. This relationship feels at once comfortably familiar but also exciting & new, and it’s a really lovely combination. So many of my plans for the future have changed in the last couple of months and some are quite uncertain right now (UNBLOGGABLE THINGS! ), and my planny little brain is having a hard time with the uncertainty. I am finding that in the absence of knowing how the chips are going to fall, my inspiration to work on any big life goals has basically gone up in a puff of smoke until I get some details nailed down. I am a girl who needs to know where my foundation is before I can attempt to soar. So the next few months will be dedicated to sorting out those details. I’m going on vacation on Friday. I’m headed to Ontario, where I went to university. It’s the most glorious time of year there. Summers out there can be stifling with heat & humidity, and winters are freezing and snowy and drag on forever. But October? Gorgeous. I can’t wait for a break from work, visits to my old haunts, and seeing people I haven’t seen for a decade. I can’t say when I’ll be back on a more regular schedule, but I will be back. Eventually! This entry was posted in Life, Relationships, Travel on September 30, 2013 by A Little Coffee. 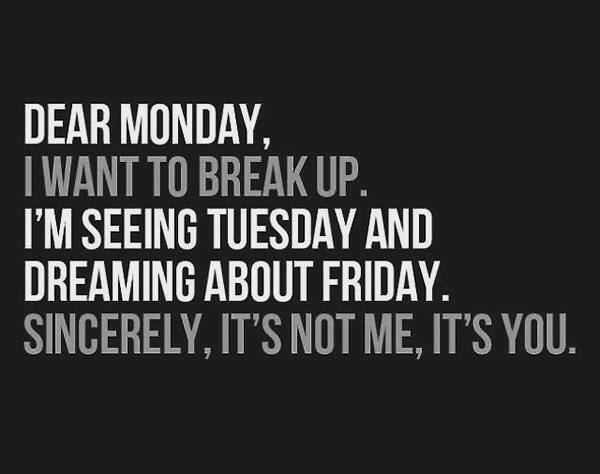 How was your week, friends? I’ve been busy since my last link post. 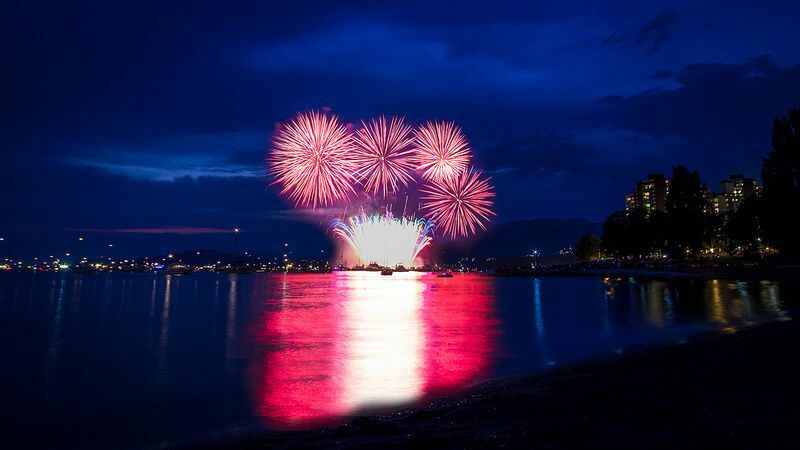 I’ve been to the waterslides, met an old friend from years ago for bellinis, spent a day hanging out with my best friend’s adorable pooch while she was out of town, and saw some amazing fireworks. Summer in Vancouver has been pretty amazing this year. If you have pets, this may shock you as it did me: apparently “pet-flipping” for profit is a thing. Great post from Sarah about how to travel with a group and keep everyone happy. This entry was posted in Links and tagged links on August 3, 2013 by A Little Coffee.